With the triumphal march of increasingly large glass surfaces in architecture, there is also a growing desire for precisely these surfaces to be designed in an aesthetically pleasing manner. 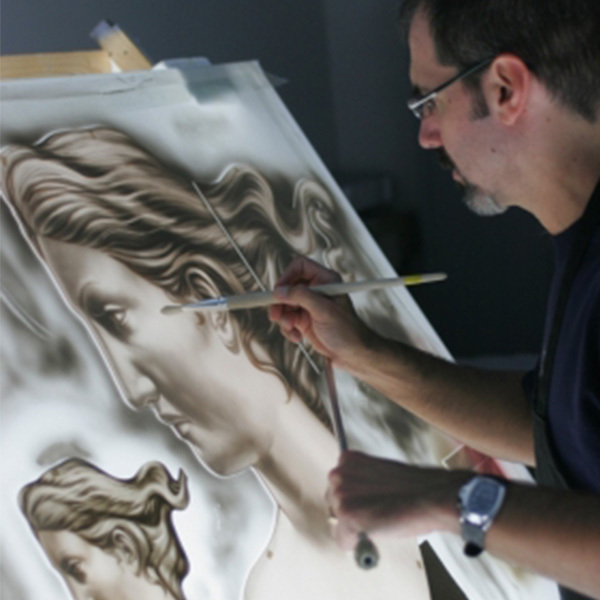 There are many different glass-finishing techniques in glass painting. People have mastered these very special techniques for centuries. 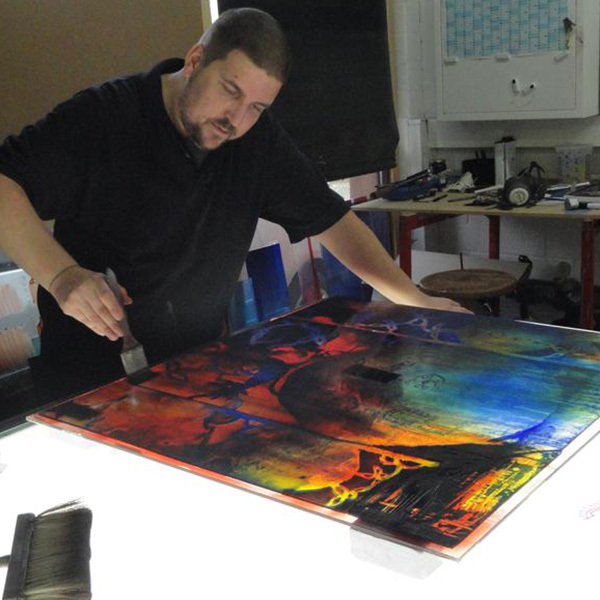 However, with the development of new, innovative materials and technologies, entirely new options of airbrushing, screen printing or sandblasting also exist today. The combination of different techniques creates new options for modern glass design and workmanship time and again. 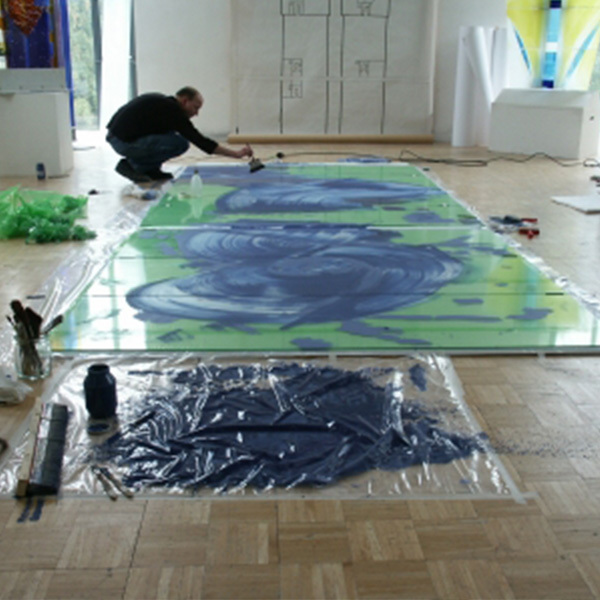 The special and unique attraction of glass painting is based on the critical relationship between glass and light. These techniques and processes have existed since the Middle Ages. Even then, they began fitting different coloured pieces of painted glass together in lead cames to produce glass windows in churches and chapels. Many coloured windows still consist of three components to the present day – the lead mesh as a framework, the glass as a medium for the colours and painting as a means of representing them. The black solder used as a stain in glass painting consists mainly of oxidised iron and copper powder as well as crushed lead glass as a fluxing agent. 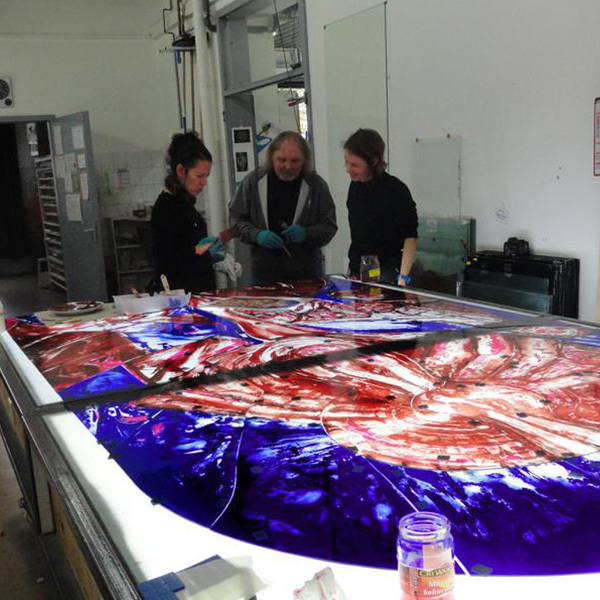 The fluxing agent causes the liquefied paint to combine with the merely softened glass base. A tiny amount of liquid binding agent such as gum Arabic also improves the black solder’s adhesive properties. An application of silver sulphide gives colourless glasses a lemon or golden yellow tint. Every glass artwork is the result of precisely coordinated individual steps. From consultation to installation, our experienced, dedicated team represents first-class and uncompromising quality from our workshop. The activities and duties in our workshop are as intricate as the requests of our clients. What are required to implement our many different ideas are knowledge and intuition, expertise and empathy. Whether restoration, glass design, reconstruction, repairs or protective glazing – our projects turn concepts into glass art works. Our many years of experience in the field of glass painting are the basis for the technically perfect and high-standard craftsmanship of our work. From screen printing to lead glazing and sandblasting, we attach great importance to a close working relationship between our clients and staff. Only then can we achieve the best possible result in the production of glass art.